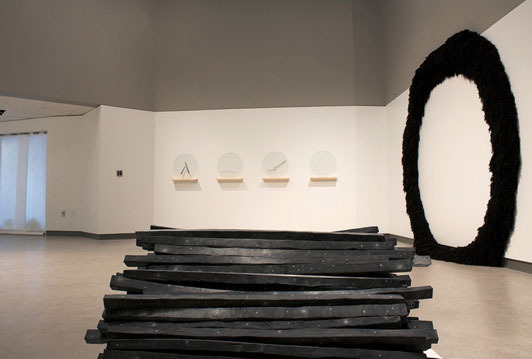 Angela Waseskuk received her BFA in painting in 2003 from the University of Northern Iowa and her MFA in sculpture and dimensional studies in 2007 from the New York State College of Ceramics at Alfred University. In 2002 she studied at the Yale Summer School of Art in Norfolk, CT, and in 2005, she was an artist in residence at the Vermont Studio Center in Johnson, VT. She is currently the Foundations Coordinator and an adjunct instructor of art at the University of Northern Iowa in Cedar Falls, Iowa. I am overwhelmed by the world, by everything that exists in it and everything that extends infinitely beyond it. I am overwhelmed by what it means to be human, by the things we have created names for as well as those things that may never be defined. It is an amazing feat that each one of us exists at all let alone the fact that we have evolved into such complex societies. As incredible as it is that we are living in such an unbelievable culture where technologies are available that seem to shrink both space and time, to the degree that it seems as long as it can be imagined it can be done, there still exist solid impossibilities. Because we are human we are without the capacity to understand it all, we are without the ability to take in every detail that exists in one moment of our lives, we do everything we can to hold on to our favorite memories, but even those tend to slip away unnoticed. The fact is that we lose so much more than we can retain, which is probably the way it should be as I would not want to be responsible for such a heavy wealth of knowledge. We cannot hold on to everything including the permanence of our own bodies. The constant filtering out of information is innate, death is certain, but the power to question is equally just as human.